Note for ePattern customers: pattern is 29 pages. 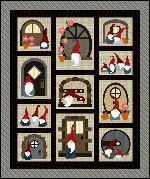 Who can resist gnomes? These happy fellows are all ready to help you celebrate the Christmas holiday season. 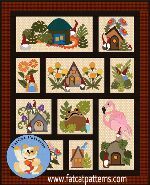 Designed for fusible applique, pattern includes full sized templates already reversed for your convenience. Finished Size: Lap/Throw 52" x 60"